Poor little thing . 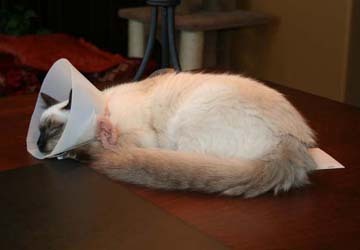 . . when Sophie got spayed, she wore a plastic collar for several weeks. Unlike her brother, Malcolm, who was back to normal the next day, she carried the burden of this plastic garb. Though uncomfortable and hindering to her activities, it was necessary for her to properly heal. Without it, she would yank out her stitches, reopen the incision, cause an infection, and delay the healing for weeks – making the situation much worse. When we first brought her home, the collar was so big she could hardly lift her little head, use the litter box (as it got stuck in the sand), eat and drink. She walked pushing it along the floor. Our hearts broke. We tried a bandage; it didn’t last two seconds. Why the vet put that huge collar on her I don’t know. We cut it to fit her, yet left it big enough so she couldn’t access her stitches. Though smaller, her sleeping, eating, and playing were much more uncomfortable. During the first week, the most critical because she could do the most damage, my eyes hardly left her little frame. If she or Malcolm removed the collar and she tore out the stitches, she would be in a mess. After several days, she stopped trying to remove it; she finally surrendered. We both wanted her stitches out, Sophie and us. She wanted them out now, but that would have led to more pain and a longer healing process. We wanted them out AND wanted her healed in the best possible way; therefore she had to endure the collar. Sophie’s situation reminded me of our journey with God. As God’s child, we desire to be who He created us to be, and do the good works He has planned for us. Ephesians 2:10 He places desires in us to motivate and direct us toward these goals. The desires are planted in our hearts, but it’s God who directs our steps to manifesting them. Proverbs 16:9 Often, His path is different from our own and often longer. Like Sophie, the desire was the same, but the paths to getting there were different. She needed the collar to get to where she wanted to be, though she didn’t realize it. God renews, heals and shapes us to move us into becoming new creations in Him and into the works He has planned for us. 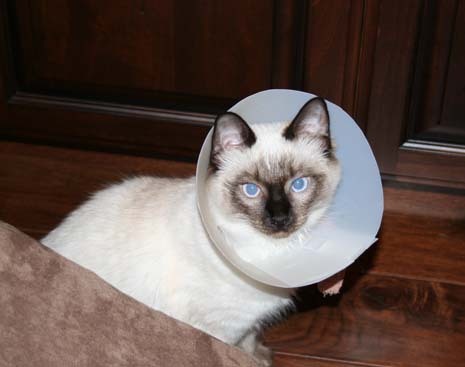 Sometimes, the best path has difficulties, like wearing that collar. It’s through difficulties that we are broken, refined, and rebuilt. It can be uncomfortable and seem unnecessary as we don’t always understand why we need the trial. We can feel hindered in doing what we should be doing like Sophie. Yet, with God all is purposeful and for a reason. He won’t give us more than we can handle. Our burdens are the perfect fit to accomplish what is necessary. They provide the best possible journey to prepare us for the life God desires for us, which is ultimately our desire. Further, we can’t compare our path to another’s. What is best for us may not be best for someone else. Therefore, comparing our journey to another’s doesn’t make sense. Unlike Sophie, Malcolm didn’t need a collar. Didn’t seem fair, but they received exactly what they needed to get them to their desired state. We need to trust our caretaker, God, who especially during trying times has a watchful eye upon us, is allowing in our lives what needs to occur so that we end up where we need to be. 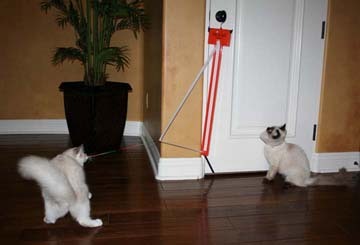 When Sophie, stopped fighting the collar and surrendered to it, her life got easier and less stressed. In a similar way, when we are obedient to what God tells us to do, we move forward more easily. Disobedience is a hindrance. Because of God’s grace, we sometimes take advantage and are disobedient to what He tells us to do, but it’s we who suffer for it. It delays our progress to where we want to be. We have to trust His path and trust eases the stress. Though the path is difficult, it’s THE path by which we will experience deep healing, growth and freedom. God doesn’t only care about the works He has planned for us, but the state of our soul. HIS path prepares us for what He has in store. Our love for Sophie is tremendous, yet how much more is the love of God for us? Our hearts broke for her to wear the collar, but it was for her good. It may be difficult for God to see us in our hardships, but He knows it’s the best. His love is perfect. Our path to our desires can be difficult and a process. We are battling against the flesh (our self-will wanting to do it our way) and having to let go of being in control and instead trust God in all His ways. We want instant, but instant is a rarity with God. Deep transformation is a journey. And it’s through the journey we build a deep intimacy with Him. God is a trustworthy and faithful Shepherd watching us every step. Psalm 32:8 We have nothing to fear. He wants us to be in an abundant life more than we do. Our part is to trust and obey what He calls us to do today and trust Him with the outcome (our desires). Sophie was much happier in the end for having worn that collar. Had we done it her way, she would have been much worse. We too are better for the trials God takes us through because we end up in a better place in our soul. As God’s child, if we are abiding in His Truth and seeking His will, we can trust the path we are on is where we need to be, and He is leading us to where we want to be, His way. Categories: Encouragement, Healing, Lessons from Cats | Tags: Bible, Christ, Christianity, deliverance, difficulties, God, God's care, God's Love, hardships, Healing, Jesus, Love, shepherd, suffering, trials, truth | Permalink. Below I share some of my thoughts on why bad things happen to good people. I’ll post the second half on Wendesday. Categories: Challenging Topics, Trials, Videos | Tags: bad things, Bible, book of Job, Christian, Christian Life, Christianity, God, God's Love, good, good news, good people, goodness, Hope, Jesus, Jesus Christ, Job, Love, Spirit, Spirit Life, Spiritual, suffering, trials, tribulation, Word of God | Permalink. The power of His name, I AM, hit me a couple of years ago and it still astounds me when I meditate on it each morning. As the source of everything that is good, God is everything we need. When we are in a relationship with Him and seeking His face and His truth then we lack nothing. As God’s children, it is no longer about our strengths, abilities or resources, but about His. His truth, love, mercy, protection, provision, peace, rest, freedom, purity, beauty, comfort, wisdom, strength, and power become a part of our lives. We have access to incredible riches that the rest of the world doesn’t because we have Him and He is everything. In Luke 5, the guys were out fishing without a bite. Jesus told them to go out and cast their nets one more time. They had been toiling day and night and caught nothing but at His word they let down the nets. They caught such a great number of fish that their nets started to break and their boat started to sink so they got another boat to help carry the multitude of fish. God’s Word has power in our lives. It accomplishes what man cannot. It does the impossible. But we have to listen, trust and act on it. In this economy, many are pulling up empty nets. But when the Word of God penetrates our lives and we trust in His words and not the words of this world then what is impossible by the world’s means is possible for those who trust in God. His wisdom and ways defy the world’s. God provides for every need. There isn’t an area of our lives that God doesn’t attend to. He is in the details because He loves us. The more you love someone the more you care about each little concern. He loves us beyond our comprehension thus He cares about everything. If we don’t believe He is in everything then we will limit out trust in Him and our lives will suffer for it. God may use the world around us to test and refine us, but we lack nothing. If we trust in His Word He will provide and fill our nets in due time. But this promise is to those who seek Him. Many Christians have cultivated a relationship with the church and not God. They seek what the church offers and not God’s truth. They spend time at church, but not one-on-one in the Word cultivating an intimate relationship with God. As a result, their lives are full of hardship, suffering and lack like the world’s. Everyone has hardship. But for God’s children it is completely different. We are always in the midst of God’s provision as He disciplines, tests and refines with the elements of this world. Tough circumstances teach us that we don’t lack and that we aren’t limited to the world. When you are in a tight situation then you see God’s deliverance that is beyond this world it is astounding. Without the trying circumstance, we can’t witness and learn about the power of His deliverance. But if we trust in worldly means then we will miss the lesson and often the blessing. We have what the world doesn’t because we have Him. Trials come for a season. The ultimate purpose of any trial is to move us closer to God and His truth. Therefore, we aren’t meant to remain in those tough places, but move through them by growing and maturing in our relationship with God. However, if we lack a love of the truth and don’t seek its revelation in our lives then we will miss out on the abundance of His promises. We will live limited lives like the rest of the world. God wants to show His power and glory to the world through His people. Tough times are the perfect opportunity. Categories: Encouragement | Tags: Bible, Children of God, God's blessing, God's power, God's strength, God's Truth, God's wisdom, Hardship, Hope, hopelessness, I AM, provision, suffering, Tough Times, trials, truth, Word of God | Permalink.